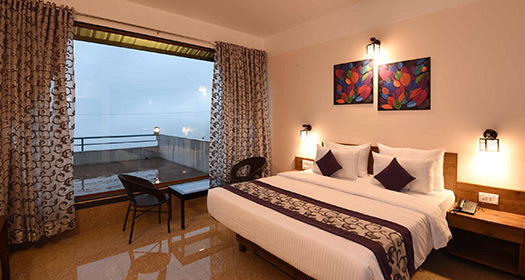 Rooms - Miraya Hotel one of the best budget hotels in Panchgani. With far more space than a conventional hotel room, the suites provide you with plenty of room to stretch out and relax. Available with one AC bedroom with an attached bathroom, an AC living room with an additional bathroom, exclusive LED TVS in both the rooms, and complimentary wireless high-speed Internet access, you would love the ambiance and indulgence the suites offer.Perfect for four travelers, the suites are great for families, friends or even business coworkers. The cordiality of the room will envelop you as you walk in. 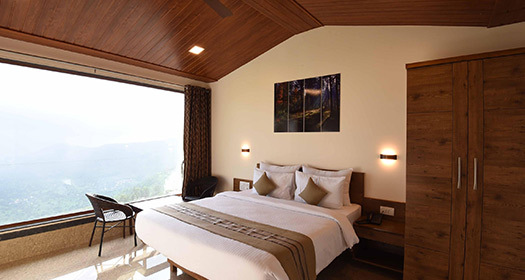 The Miraya Vista rooms provide a supreme setting for complete relaxation, an unobstructed valley-view and offer an abundance of natural light. 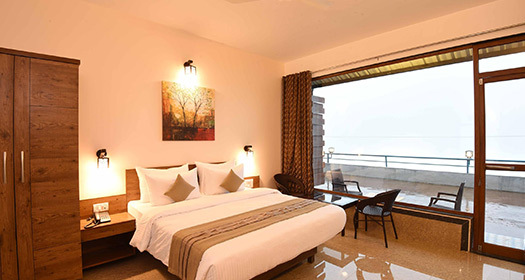 These contemporary furnished rooms have an attached bathroom and are ideal for two guests. The name says it all!! The highest rooms at Miraya provide you a charismatic view of the entire valley and offer luxury that is beyond imagination. Each Miraya High room comes with modern interiors and a range of modern facilities catering to every need and comfort of the guest. To make your stay unforgettable, the room is well maintained and perfect for two guests.